Transport and disposal costs, at over 70 percent, represent by far the largest cost item in sludge dewatering. A powerful dewatering assembly is thus an important criterion. With a Flottweg HTS Decanter in the C series, you can achieve the highest possible total dry solids in the dewatered sludge, thereby continuously saving on transport and disposal. 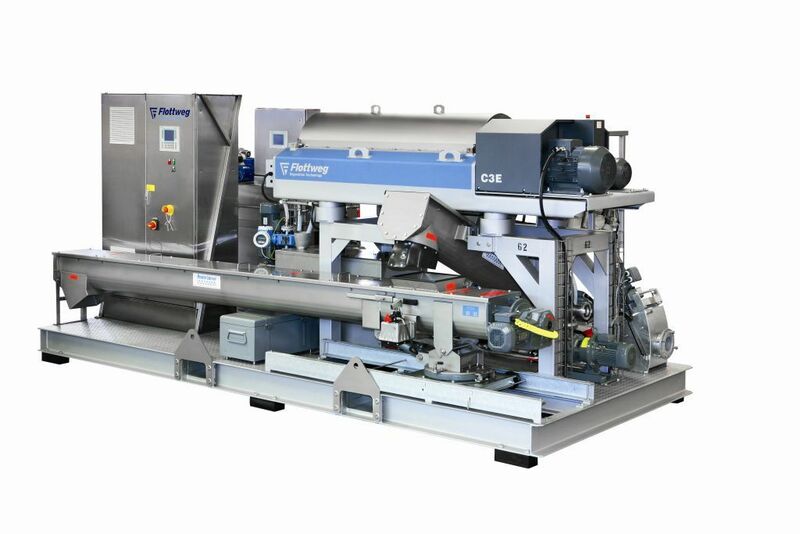 The Flottweg C series is a high-performance centrifuge for sludge dewatering with the highest possible total dry solids. An energy- and power-efficient Flottweg Simp Drive®, combined with the optimized geometry of this decanter centrifuge, ensure total dry solid values that are several percentage points better than other models. For example, by increasing these values from 23 percent to 25 percent, Flottweg customers can reduce sludge volume by eight percent. As a result, transport and disposal costs also fall by eight percent. That savings potential means that an investment in the latest dewatering technology from Flottweg can be amortized over a very short time. The best possible quality and the greatest possible reliability also permit the operation of Flottweg decanter centrifuges for 20 years or more. The design of the Flottweg HTS Decanter is specifically adapted to the particular properties of sewage sludge. It meets the needs of sewage treatment plant operators in terms of economy and user-friendliness. The optimized geometry provides the highest possible total dry solid content in comparison with other decanter centrifuges. You can benefit from low-cost operation in terms of energy and polymer costs. With no modification at all, all these advantages apply to both the dewatering of digested sludge and to the direct dewatering of undigested surplus sludge. The Simp Drive® regulates the differential speed between the decanter bowl and the decanter scroll depending on the scroll torque. This is done during ongoing operation. The bowl and scroll of the decanter move independently of one another. The Flottweg Simp Drive® also provides the full torque both with the bowl at rest and at maximum speed. During ongoing operation, any change in feed rate is detected by automatic torque regulation. This permits Flottweg to ensure the best possible quality of the solids discharged, since the system can react to changing product characteristics in the feed. In comparison with other dewatering systems, the Flottweg HTS Decanter offers you the following advantages. More than 50 years of experience in the dewatering of sewage sludge and continuous further development have gone into the design of the Flottweg HTS Decanter. This experience, combined with references from the entire world, makes Flottweg one of the leading providers of mechanical separation technology. The HTS Decanter is attractive for its performance, its efficiency, and its high cost-effectiveness. The decanters in the Flottweg C series cover a throughput range from about 5 to over 150 cubic meters per hour.